Gigabyte officially released the GA-X58A-OC and claims this is world's first true overclocking motherboard thanks to all-new tweaking and insulating features. 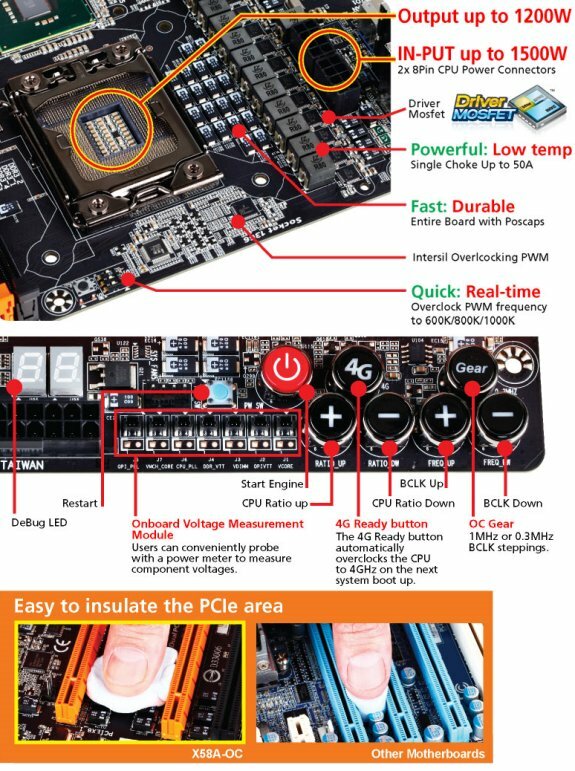 GIGABYTE TECHNOLOGY Co., Ltd, a leading manufacturer of motherboards, graphics cards and other computing hardware solutions today announced the launch of the world’s first motherboard designed from the ground up for extreme overclockers, the GIGABYTE GA-X58A-OC. Its overclocking specific performance design defines a whole new category of enthusiast focused motherboards that introduces never-seen-before tweaking and insulating features. Based on the Intel® X58 chipset (Tylersburg) and supporting LGA 1366 socket CPUs such as Intel’s new top of the range Core™ i7 990X Extreme Edition CPU, the GIGABYTE X58A-OC takes advantage of all the performance benefits that the X58 platform has to offer including triple channel DDR3 memory support, 6 core 12 thread CPU support, and enough PCIe Gen 2.0 bandwidth to support 4-way CrossFireX™ and 3-way SLI™ for the best graphics performance in the world. 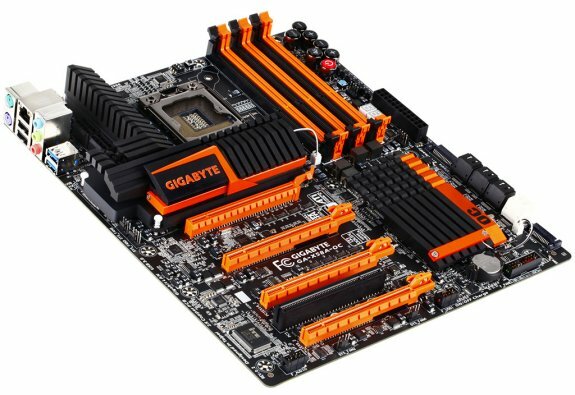 GIGABYTE has listened closely to the overclocking community to make sure the X58A-OC has all of the overclocking features enthusiasts have been asking for, without some of the features that are unnecessary while overclocking, or can negatively impact performance - similar to a stripped down sports car where the aircon, radio, passenger seats, etc… have been removed to reduce weight. Layout was a critical aspect of the design, not only in choice of components used, but also spacing of the components so that insulation of the board is as easy as possible, while still maintaining the most efficient data pathways between the various components. GIGABYTE is also introducing 5 new main overclocking features on the X58A-OC that help to push the performance envelope of the X58A-OC even further including OC-VRM, OC-Touch, OC-PEG, OC-Cool and OC-DualBIOS™. By being able to switch between 2 different BIOSes, OC-DualBIOS also allows users to test drive a new BIOS without having to update both BIOSes with the same update, helping to save time and unnecessary BIOS reflashes.